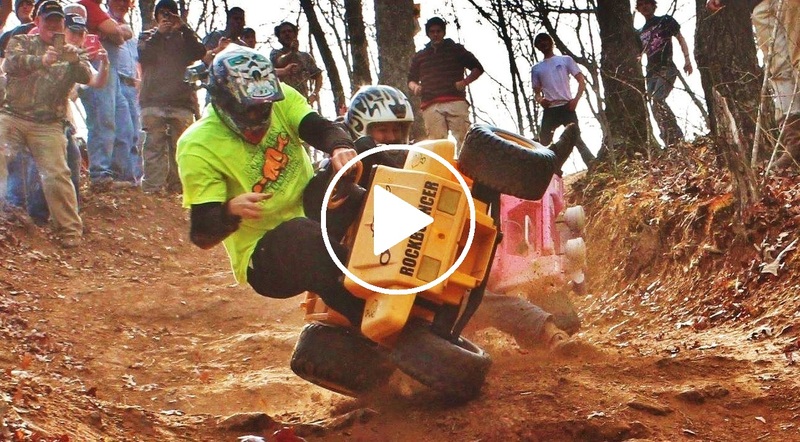 The Extreme Downhill Barbie Jeep Racing 2015 race season started off with a bang. Every year we get pumped up for the season opener Extreme Downhill Barbie Jeep racing event. It takes place every year at Hot Springs Offroad Park in Hot Springs, Arkansas. The event is called Battlefest and this was our second year beginning the season here. Bad weather kept many away but the 10 racers that showed up battled it out in the rain for Bragging Rights. The rain had made the steep hill slick with a small stream you had to splash through just before the finish line. We even had two ladies battle it out in a grudge match. Lucky for us we had the one and only Tripp Pullen giving us the play by play as racers crashes all over the course. We also had one of the best comebacks in Downhill Barbie Jeep Racing history. CJ Bynum crashed at half track. His opponent passed him and began his celebration a little too early as CJ climbed back on his rig and took him out just before the finish line winning the race. Me being the 2014 Champion I had to give it all I had to continue my win streak. I took home the win with ease in my John Deere Gator and plan on being the Extreme Barbie Jeep Racing 2015 champ as again! For more videos check out our Downhill Barbie Jeep Racing Playlist on Youtube. Check out the 2015 Championship Video from Morris Mountain ORV park in Alabama.